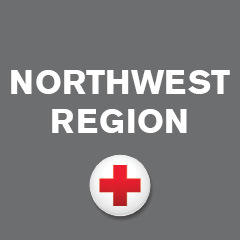 Renton-based Red Cross volunteers Vicki and Bill Lee made their way across the county to help families who were impacted by the devastating floods in South Carolina. Here is are some insights to how they pitched in at a time of crisis. Vicki Lee of Renton, Washington, joined by her husband Bill, traveled to South Carolina to pitch in for flood relief. Like ants they move, Red Cross trucks aligned, and loading up boxes of hot meals from pallets stacked with food like green beans, hot dogs, fruit, water and other snacks at the Baptist kitchen in South Austin. They hand off meals and snacks to the tired and hungry residents as they emerge from their flood ravaged homes. For many, it’s the first meal they’ve had since the Red Cross truck was there the night before. For some like Jamie Fowler, it’s like déjà vu hearing and seeing that Red Cross truck rambling down their street. Jamie lived through the Katrina disaster ten years ago. She lost everything. She tears up as she gets in line to get a meal. Vicky, Bill, and Rowland smile at those in line who surround the truck, serving up hot meals in to-go boxes for family members still working inside their damaged homes. Many say thank you, some loudly, some just mouth the words. Vicki who’s serving the food from the truck window, just nods and smiles. “It’s heartbreaking,” she says, trying to fight back tears herself. piled high with people’s belongings and memories. They know the small gesture of a fresh meal goes a long way in helping families while they pick up the pieces and think about what’s next. 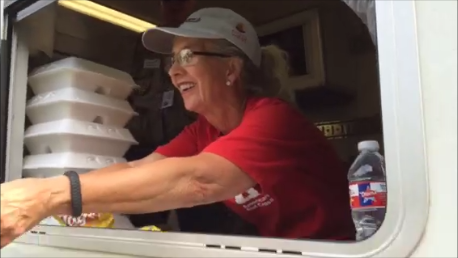 They’ll be back again tomorrow—with hot meals, hugs and flyers with more Red Cross recovery information—to do it all over again.